"...and whatever happens, I've to to be...brave." If everyone had a sword capable of speech and magic, there'd likely be a lot more adventurers in the world. Well, very few do have that and Nim #1 features a character given such a gift. The issue is written and illustrated by Mark Nappin. 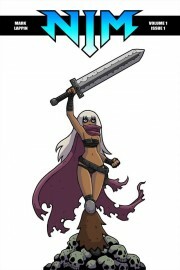 Nim is a young adventurer with a magical sword named Valbrand. The duo make a rather formidable team, with Valbrand offering up plenty of ability to make sure that Nim gets through all manner of undead horror and dangerous locales. Her mission is the soul of a powerful, undead opponent, which she plans to leverage into something she needs. As a main character, Nim has many of the requisite characteristics that go into a female warrior: feisty, smart and a little cocky. Nappin gives her a good rapport with Valbrand, as the two of them banter throughout the tale in an effort to keep the story moving. This is useful, as it properly paces the book, but there are a few pages where the dialogue feels a little overwhelming. There's a ton of text on some pages that hinders the book a little, mainly because the reader starts drowning in the dialogue a bit. The story is pretty standard as well as far as fantasy tales go, with Nim playing a pretty familiar role. Nim eschews more traditional body armor for some rather skimpy outfits, which is likely done in an effort to make the book visually appealing. The majority of Nappin's style is somewhat cartoonish and looks a lot like Bryan Lee O'Malley's Scott Pilgrim. Nim #1 doesn't feature quite the same bombast, but there are some stylistic similarities in terms of how the characters present themselves and interact with one another. Characters are clearly defined and stand out from the backgrounds. They're also accented with very vibrant colors that help to further set the tone and atmosphere of the book. Nim #1 will appeal to fantasy fans. It seems like Jim Zub is something of an inspiration as well, as Nappin offers a story similar to one he would create. The story is pretty harmless and gives readers a character in Nim who's fearless and cocky, jumping right into the thick of things. Nappin's illustrations are effective for the book and keep things relatively lighthearted and comedic. Nim #1 is the start of a pretty fascinating adventure that could play out along a rather interesting path. Nim #1 is available via Comixology now.